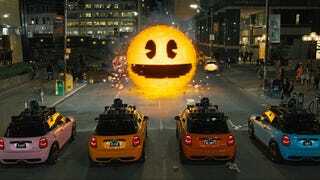 As you have likely heard, Pixels is a bad movie, almost pleasingly stupid. After watching it last night, I had more fun retelling the plot to my wife, who had never heard of the movie, than I did sitting through Pixels. I am now going to spoil it, all of it, so that you don’t go see it. In 1982, a young Brenner (Adam Sandler) and a young Cooper (Kevin James) pedal to a new arcade called The Electric Dreams Factory, located next to a Video Visions. We see cabinets of Pac-Man, Donkey Kong, Galaga, Centipede, Qbert, Defender, etc. Cooper pulls a Chewbacca mask from a claw/crane game, and Brenner discovers he is a Billy Mitchell-level arcade talent. A third boy, Ludlow the “Wonder Kid,” has a crush on Lady Lisa, a pixelated, blonde Xena-like character from a mythical game called Dojo Quest. Brenner enters himself into the 1982 worldwide arcade championships, where he loses a tiebreaking Donkey Kong title bout to Peter Dinklage’s character, Eddie Plant, who has nicknamed himself The Fireblaster and enters the arena flanked by two leather-pantsed girls. Dan Aykroyd emcees the tournament and announces that footage of the games will be included on a probe that is being sent into space. Flash forward to the present, where Kevin James/Cooper/”Chewie” is an unlikely president of the United States, a George W. Bush-like figure who struggles to read children’s books at elementary schools and is booed by bystanders for a foreign war. Brenner works for the Nerd Brigade, a Geek Squad-like company that sets up A/V equipment for people. Chewie tells him, oddly, that high-level video-game playing has no monetary value anymore, that it is an outmoded skill like blacksmithing. For his Nerd Brigade job, Brenner goes to Michelle Monaghan’s house to install a PlayStation and a 4K television for her son, who has received these gifts to make up for his parents’ looming divorce. Brenner tries to seduce Monaghan’s character, Violet, in a closet. Violet rebuffs him but is clearly charmed by the advances of a contractor in her house. Brenner tells her that nerds are better kissers. Simultaneously, creatures from Galaga attack Guam. The president calls Brenner and summons him to the White House for his retro arcade expertise. Violet turns out to be a Darpa scientist, and they head to the White House together. In the Pixels universe, Galaga is deemed to have been glitchy in 1982 and therefore was recalled and replaced with new machines in 1986. Brenner notices that the attacking aliens resemble 1982 Galaga, a version that doesn’t exist anymore. This persuades no one of anything. The other friend from Act I, Ludlow, asks Brenner to visit his home. Ludlow still lives with his mom, in a room papered with articles from the Weekly World News. He is a conspiracy nut who believes there is a pyramid under the Hoover dam and that the Zapruder film has been edited to remove evidence that “JFK shot first.” Ludlow has been investigating the Guam invasion by reading 4chan and watching reruns of the CW’s One Tree Hill on videocassette. During one of the episodes, the aliens communicated with Earth by speaking through images of Ronald Reagan, Tammy Faye Baker, and Desperately Seeking Susan-era Madonna. Then the aliens destroy the Taj Mahal using Arkanoid. The president summons Brenner and Ludlow to the Oval Office. Darpa has been analyzing the alien attacks and has invented light guns that can destroy them. President Chewie asks Brenner and Ludlow, the “civilian arcaders,” to help train the Navy Seals who are going to fight the next alien invasion. Jane Krakowski shows up as the first lady and is given nothing to do. The “Where’s the beef?” lady, not shown on screen, announces that the aliens will attack London. Ricardo Montalbán and Hervé Villechaize of Fantasy Island congratulate humanity but announce that everyone gets three lives in this game, and that the aliens currently lead 2 to 1. They send the dog from Duck Hunt to earth as a trophy. The three men travel to Manhattan to fight Pac-Man. Violet has designed ghost-like cars with license plates that say “Blinky,” etc. The men wear Ghostbusters-ish jumpsuits that say “ARCADER” on them and have “1UP” arm patches and Qbert pyramids above the chest. Toru Iwatani, the actual creator of Pac-Man (portrayed by the actor Denis Akiyama), joins them and has his hand bit off. The Pac-Man who shows up is not the two-dimensional Pac-Man from Pac-Man but is closer to a legless and armless representation of the caricature on the Pac-Man arcade cabinet, or perhaps a naked, limbless version of the Pac-Man in 1984’s Pac-Land. Brenner/Blinky defeats Pac-Man. Earth is given Qbert as a trophy, and then Brenner watches Violet’s son, Matty, play The Last of Us and complains that there are no easy patterns to follow to beat it. “You’ve got to pretend you are the guy,” Matty says. Later, Qbert says “bullcrap” and an expletive-symbol world balloon appears above his head. Qbert tells Violet, Brenner, and Matty that his world was peaceful until the aliens felt threatened by the arcade footage on the space probe and began preparing for war. Violet goes on a date with Brenner to some kind of navy ball. She tells him he should invent technology, not just play it. “I had my shot, as a kid, in the arcades,” Brenner says. Fireblaster is revealed as a cheater, inexplicably using cheat codes in 1970s arcade games to become world champion. Footage of 1980s Daryl Hall and John Oates announces the final alien attack, an abandonment of protocol as all the alien arcade warriors—Space Invaders, Paperboy, Galaga, Joust, Frogger, Tetris, Dig Dug, Mario, Burger Time—arrive at once. There are also pixel ninjas. And Violet shoots a Smurf, even though there is no arcade game with Smurfs in it. Lucky Lisa arrives, Ludlow professes his love, and they agree to marry. Inside the spaceship, the aliens have constructed a three-dimensional physical obstacle course that looks like the first Donkey Kong level. A pixelated Kong hurls barrels that Brenner, Violet, et. al., must leap over. Qbert urinates on the ground in fear. Brenner is not invincible when he grabs the hammer to destroy barrels, and he can still climb ladders while holding the hammer, too. (I realize I sound like Comic Book Guy, but c’mon.) Brenner hurls the hammer into Donkey Kong’s chest and he explodes into pixels, because that’s totally how you defeat Donkey Kong.